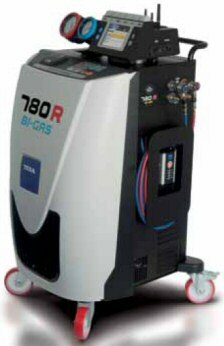 Automotive Air Conditioning, fault diagnosis and refrigerant recharging stations. With your own 'Air Conditioning Service' equipment there is no need to farm out valuable AirCon work (& profits) to a specialist AirCon servicing company. 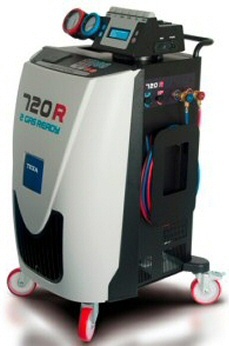 Repair / Service - car, van, LCV, coach & HGV air conditioning units in your own garage / workshops. Around 80% of new vehicles are fitted with air conditioning as standard, the manufacturers are recommending that the airconditioners are serviced at least every 2 years. This involves recovery of the old refrigerant, replace receiver drier, check system for leaks, recharge with new refrigerant and lubricating oil. All of these actions are simple with a semi-automatic AirCon service unit, with a fully automatic system it's a case of connect up, go away and do another job, the fully automatic air conditioning servicing unit will complete the task and let you know when it has finished, producing a print out confirming each stage plus weight of refrigerant & oil. • has Car, Van, Truck, Agri & Personal database. • 2 year factory backed Warranty • CE & TUV Certification. • Complete packages and accessories. • Competitive Leasing Deals • Free Delivery & Training. dual air-conditioning charging machine, R134a Standard & Hybrid /Electric plus R1234yf Standard & Hybrid/Electric. Cars type approved after 1st January 2011 must use a refrigerant with a GWP (global warming potential) of less than 150. Existing R134a charging machines do not meet the criteria for recovery and charging R1234yf. R134a and R1234yf must not be mixed. Require specific lubricants for safe compressor operation. Cross contamination of lubricants can lead to compressor fires ! Only charging machines with a specialised flush and lubricant selection program should be used. R1234yf refrigerant will cost approximately £130 per vehicle charge, based on current projected prices per Kilogram.